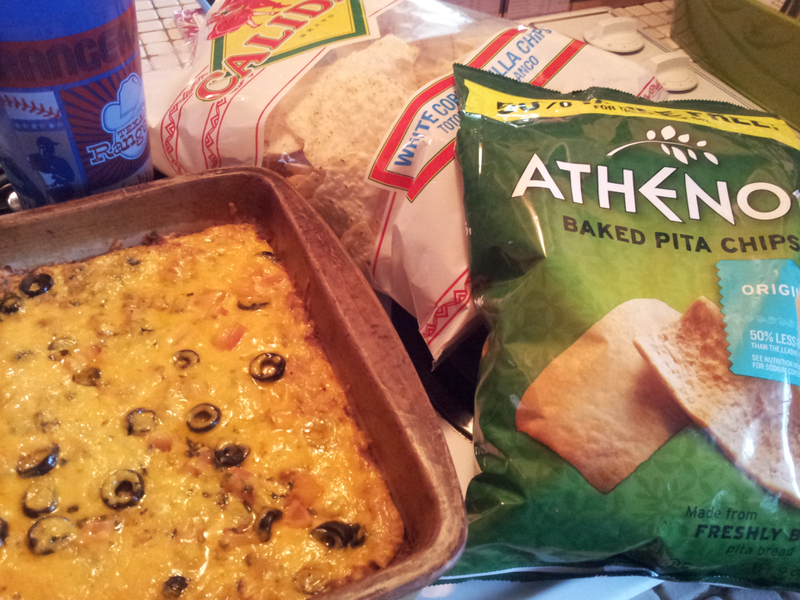 Great party dip full of Mexican flavor for any occasion not just football. Preheat oven to 375 degrees Fahrenheit. Spread beans in bottom of 8x8 pan. Combine cream cheese and taco seasoning mix in small bowl. Add minced garlic. Spread cream cheese mixture on top of beans. Sprinkle tomato, olive, onion, and cilantro over cream cheese mixture. Top with shredded cheese. Bake 25-30 minutes or until hot. Serve with sour cream and chips. Make sure to have cream cheese at room temperature. It makes adding the ingredients easier and a more smooth texture. You can prepare this ahead and refrigerate but don't add tomato, onion, olive, cilantro, and cheese until ready to bake. Prep all those ingredients and bag them for a quick assembly right before your party.